We were up bright and early today for our final service project day. We were only going to be at the Albergue for half a day so that we would have the afternoon to experience the sights of Cusco, do any last minute souvenir shopping and pack since we have an early morning flight back home. The team was anxious to make more progress today even though we knew the work would have to be continued and finished by future volunteers. It was satisfying to see the structure coming up, especially the log fence which we managed to get up and even paint a few pictures on. The younger volunteers really enjoyed the painting. 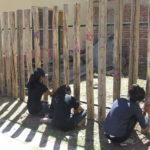 It gave them an opportunity to leave a personal mark on their hard work and made the fence more fun for the kids at the Albergue. We enjoyed another healthy lunch before saying goodbye to all. We headed back to the hotel, showered up and hit the cobblestone streets and main square in Cusco. We really enjoyed the walk, the sights, the shopping, and couldn’t decide where to grab dinner. 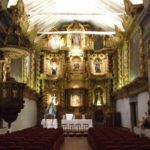 One of the most beautiful sights was the church at the hotel Monastario. The carvings were so intricate and the colors so vibrant. 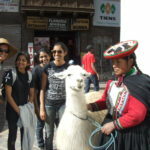 Our trip to Peru was a lot of fun. We really enjoyed all the sights. Machu Picchu was definitely a highlight, but all the service projects we worked on throughout the week were just as enjoyable, fulfilling and really gave us an opportunity to interact with the local Peruvian people. They are very friendly, grateful and welcoming. 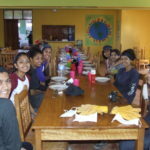 I would definitely recommend Peru as a vacation destination with an opportunity to give back…. Hi! I’ve been reading your website for some time now and finally got the bravery to go ahead and give you a shout out from New Caney Tx! Just wanted to say keep up the excellent job!